Recently, USCIS changed the required filing process for when an H-1B employee changes work locations outside the area of intended employment. If any of your employees have changed work locations since the most recent H-1B filing, you may need to file an amended petition. This new policy change is retroactive, which means if any of your H-1B employees have changed work locations since the most recent H-1B filing, an amended H-1B petition MUST be filed. Failure to do so can result in penalties, such as fines and debarment from the H-1B program. All amended petitions MUST be filed before August 19, 2015. If there is an upcoming work location change for an employee, which is outside the area of intended employment, the move CAN NOT take place until the amended I-129 petition is filed. Employers can no longer just file an updated Labor Condition Application (LCA). Review any H-1B employees who have made work location changes since their most recent H-1B filing. Request copies of the employee’s most recent H-1B petition. If Envoy filed the most recent petition, contact customer support to request a copy of the petition. If Envoy did not file the most recent petition, contact the attorney who did. Audit the petitions and determine if the employee’s work location change is outside the area of intended employment. This is generally an area of normal commuting distance. We recommend that you perform this audit because more often than not, work location changes are not communicated to us, making it difficult for us to determine which petitions need to be amended. For any work location changes that are outside the area of intended employment, an amended I-129 petition must be filed before August 19, 2015. 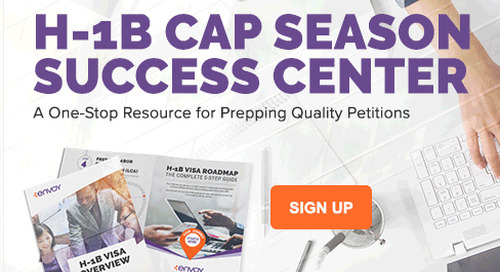 If you have employees who’ve made work location changes since the last H-1B filing, request a copy of the petition by emailing customer support at customersupport@envoyglobal.com. To begin work on an amended H-1B petition, please contact your client manager directly or call (855) 960-5403. The post USCIS Revises Filing Requirements for H-1B Holder Worksite Changes appeared first on Envoy.